If there is one advance in technology that I am most grateful for, it is satellite navigation. Last night my trusty Tom Tom led me from Reading, along dark and winding roads, to Winchester. The light at the end of my journey was a stylish sitting room with a wood-burning stove, several plates of pizza and two bottles of wine. An old school friend had heroically persuaded her book club to read my new novel, A Sister for Margot, and had invited me along for the fun! Ha! The group included an inspiring line-up: four teachers, a management consultant, a doctor and a journalist. For a brief moment, I rather wished my satnav had left me stranded on the A33 Reading relief road. Seven sets of curious eyes alighted upon me. Feeling slightly sweaty, I wondered if Margot and her relations were up to this. 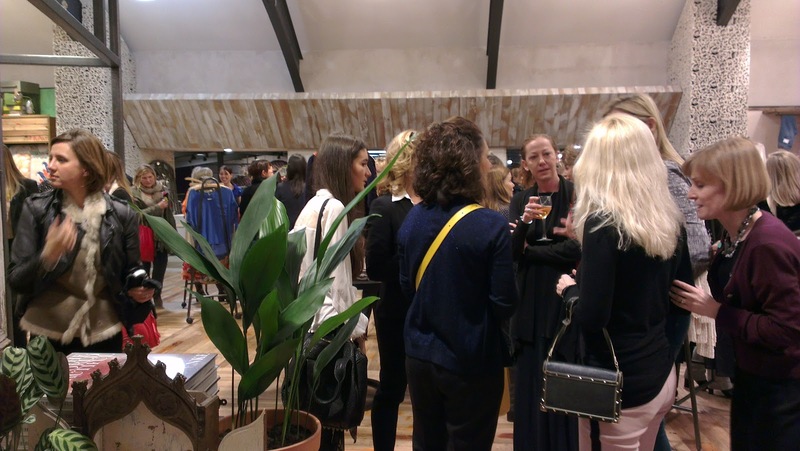 To date, I have chatted to journalists and I have been interviewed on radio, but this was the first time I had come face-to-face with a room of discerning readers. In some senses, this was the culmination of everything I have been trying to achieve: a book that people will read, enjoy and discuss. But like so many things, when you get there, you wonder what you've started. There is a theory of literary criticism called formalism that strives to analyse a text by focusing on the work itself and disregarding the author. Last night we did away with formalism. The book and I came as package, and inevitably my panel of readers interpreted it through my experiences and influences. Were the characters based on real people? How did my becoming a mother shape the book? One of the characters loses her parents when she is nine. What happened to me when I was nine? But it wasn't all about me, I realised. Each of them brought something new to the book - their own response. There is another vein of literary criticism more concerned with the reader's experience: each reader is unique with different ideas, educations and values, and therefore interacts with the book in a singular way. The English teacher, for instance, shared her analysis of my syntax and imagery (terrifying) while the history teacher asked about my research on the second world war (slightly less terrifying). Another member enjoyed the scenes in Ibiza because it brought back memories of a teenage holiday. 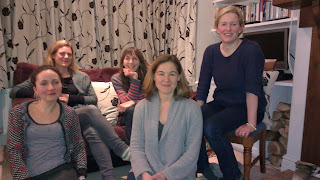 A big thank you to the book club in Winchester, and most particularly to Emily who stuck her neck out to arrange this. 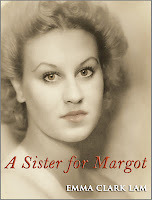 A few weeks ago Marlow FM radio station invited me onto its Book Club programme to chat about my novel, A Sister for Margot. Other than producing the odd burst of audio for BBC News Online, this was my first time behind the microphone. For a few minutes, basking in the afterglow of my adrenalin rush, I felt convinced I had joined the ranks of Jane Garvey and Kirsty Young! Unlike Radio 4, Marlow FM is tucked away on the banks of the River Thames, amidst wooden chalets and a welter of outdoor pursuits. Avoiding a trailer full of canoes, I tip-toed through the mud and into the studio building, where a large sign instructed me to remove my boots. 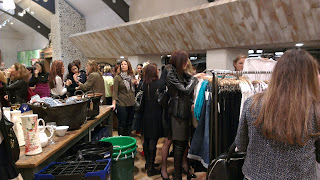 As luck would have it, I had cracked open a new pair of 60 denier tights that morning. Thankfully I was able to tread the studio boards with pride (my toes respectably shod). At the end of the programme, co-presenters Chrissy Hayes and Clare Bones chose A Sister for Margot to be Marlow FM's Book of the Month. Tune in online Friday 1 March at 9.30am to hear what they thought of it! Get as close to the mic as you can without eating it. Frantic handwaving from Chrissy at the beginning of the interview indicated I hadn't taken her quite literally enough. Don't ramble. My lengthy answer about what inspired me to write the book was in danger of killing the interactive vibe! If the audio controls above do not work, you can also listen to the interview by clicking here. Thanks to Vanessa Woolley of Marlow FM 97.5 who arranged the programme and provided the clip for me to post on my blog. Marlow FM is a community radio station in Buckinghamshire, staffed by volunteers. Middle Child told me at bathtime last night that he wanted to stay living with me until he was 40 years old (his equivalent of old age). This was in response to my lament that he was growing up too quickly. With tears in his eyes, he told me he didn't want to become a big boy. We are both afraid of his increasing independence and what it spells for our relationship. This is the central contradiction of parenting: on the one hand we want our children to progress and meet all their milestones, but on the other we can't bear the idea of our babies growing up and living beyond our influence. Don't grow up too fast, baby! Last week I was dropping off my nine-year-old, the Quiet One, at school. Normally we say goodbye in the school hallway - public kisses are no longer permitted. I have to content myself with a wink and discreet shoulder squeeze. On this occasion, however, I popped into her classroom to remind her about some homework that needed handing in. She was horrified by my intrusion. "Mum, you are embarrassing me!" Girls, particularly in the West, seem to grow up too quickly. I was listening to Libby Purves a few weeks ago on Radio 4's Midweek programme. One of her guests was reminiscing about attending school in India: he recalled how 17-year old girls were content to play hopscotch in the playground. That would never happen here. A slew of factors - pop culture, commercial pressures, the fashion industry and rafts of examinations - means that our children are too eager to ape the grown-ups. They cast off their innocence like a Boden party dress, in the race to keep up with their peers. Suddenly it's all about skinny jeans, Gangnam Style and rather inappropriate dance moves. 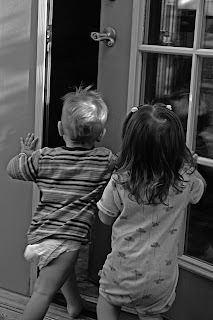 When my two eldest children were babies, I thought it would last forever. Now I see how quickly those years pass. I watch Non-Walking Toddler's progression with a crushing sense of nostalgia. And yet I am desperate for her to start walking! When she took a few tentative steps between the sofa and the coffee table the other day, I cheered her on like she was running 100 metres in the Olympic finals. We are hardwired to push our children onwards, even if our hearts protest. Quiet One brought some friends home this week. Over sausages and chips they discussed which of the boys they liked most in the class. "Girls," I said, "don't grow up too quickly. You can always go forwards, but you can never go back to the past." They looked at me like I was talking nonsense. They were right. How can we expect them to resist the culture we impose upon them? Their budding minds are designed to absorb these formative influences. The challenge lies with us - we need to give them less screen-time, more adventures, more time outdoors and some immunity from everyday pressures. Parents will always have an eye to the past and an eye to the future. The trick is striking a healthy balance. When I was putting Middle Child to bed, he amended his earlier statement. "Actually Mummy, I think I will only live with you until I find a wife and build my first house." Yes, very wise, little man.